It was a subdued night at the MK Dons Player of the Year awards on Tuesday night. 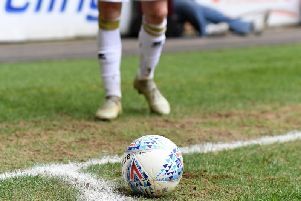 Held three days after relegation to League 2 was confirmed, there was no awards to honour the first team accomplishments following the club’s worst season in their history. There was no grand entrance for the players, no congregation on stage for a round of applause for a job well-done over the last nine months. Instead, an apology from Dons chairman Pete Winkelman. He said: “We’ve made huge changes to the way the awards run, very different to the way we’ve done it before. “But at the end of the day, I’m a supporter, I am upset, I am frustrated and I am disappointed. At the end of the day, you either fall over and think it’s all too hard, or you stand back up and go for the next round. “I am tenacious, and there’s no way I can accept this lying down. “We have to fish in a different pond, we have to look at what we’re going to do and it will be different to how we’ve done things. “We may have to look at the past to what we’ve done before. This team has to be competitive, has to be competing week in, week out. There were still awards handed out though - keeper Lee Nicholls won Community Ambassador, Alex Gilbey was named Media Personality while Callum Brittain won the MKDSA Young Player of the Year. Alice Hughes was named Ladies Player of the Year, David Kassumu won Academy Player of the Year while Tommy Hope’s cracker against Cardiff for Dons U18s won Goal of the Season. Mike Dove rounded out the night with the Chairman’s Award.